Incoming Natural Resource Ecology and Management (NREM) students had a chance to learn about the monarch butterfly recently at the NREM fall mini-camp that was held at the 4-H Campground in Boone County on Saturday, September 19th. Tory Pocius, a Ph.D. student and Sue Blodgett helped the students learn how to distinguish males and females and apply tags to migrating monarchs as they passed through the camp. 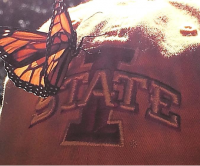 Photograph of Monarch butterfly landing on an Iowa State University hat.